Bringing up Bella: Wordless Wednesday 129 - Are you talking to me? Wordless Wednesday 129 - Are you talking to me? That looks like a mischievous face today! What's that Bella? Nope, we can't see any boogers! You're fine! Aw, I just want to boop that nose! :) What a sweetheart! Cute pic! Yes, we are looking at you! And we like what we see! Yes, I'm talking to you! Don't give your mom a hard time about your crate. :) (Ha, if only it were that easy, right??). She's a cutie pie, even with attitude. Obviously my memory is terrible too! Yes, I got the De Niro reference, even though I remembered the quote wrong! (Don't know how I managed that, since I actually have a passing reference to/joke about that quote - the RIGHT quote, as you have it - in the manuscript I'm working on!) D'oh. Awwwww! I want to kiss that face! She does a better de NIro than I do! I just want to smooch her darling face!! 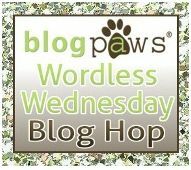 "A list of all good things"
Wordless Wednesday 127 - I'm gonna get you!